Open government advocates say that charging for records could limit government transparency and prevent some from accessing government records. They argue that governments could control costs by better managing their records and being more efficient in their responses. However, open government comes with a price tag to the tune of about $60 million in Washington — in one year alone. 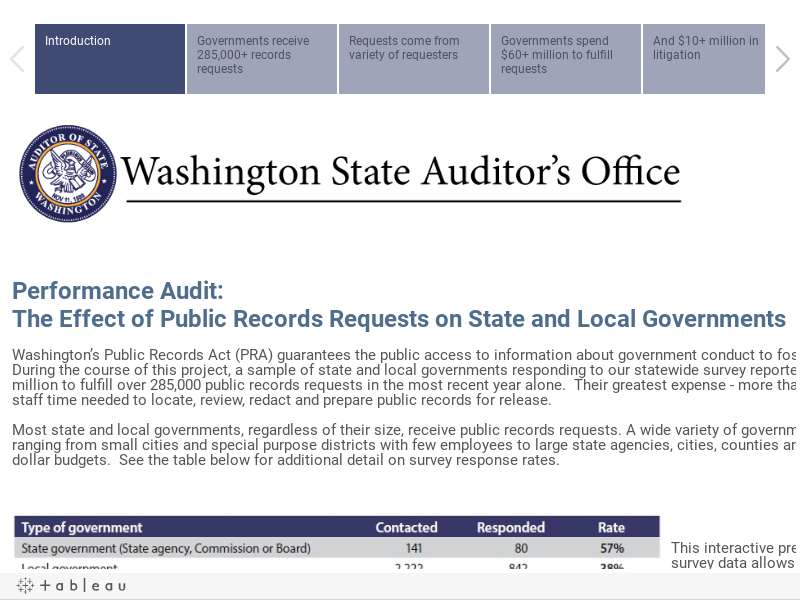 A recent performance audit of Washington’s state and local governments found that governments spent more than $60 million fulfilling public records requests — more than 90 percent of which was staff time. This number is likely higher, because not all governments track costs and many did not respond to the survey. The cost is largely associated with searching for information (both on computers and on paper, which might be stored off site), and reviewing and redacting confidential information on hundreds if not thousands of pages of information. On top of it all, governments paid $10 million in litigation costs in the most recent year. Governments recovered less than 1 percent (about $350,000) of those costs from requesters. Why? A major reason is that the Public Records Act doesn’t allow governments to charge requesters for much more than just the cost of paper copies and other physical materials. As a result, the bulk of costs is borne by government and, ultimately, taxpayers. The high price tag of providing government transparency isn’t limited to Washington. Other states describe similar challenges with disclosing government records and also outline their attempts to address them. Charging for costs associated with personnel time or by a document’s size are just a few examples. On the other hand, some governments in Washington and other states support the idea of billing requesters for the cost of providing records. They argue that some requests are preventing them from efficiently providing other essential government services, and recovering costs might get them resources that could help them provide responses more quickly. Regardless of either stance, striking a balance between providing access to public records without unduly affecting government operations would seem ideal, but it is a challenging endeavor to accomplish. The report provides practices state and local governments can use, and strategies that legislators can consider when deciding how to resolve the public records issue. You can read the full report here.